James Monteleone (’16), Paola Jaime (’17) and Jeffrey (“Randy”) Taylor (’16) won best brief in the Brooklyn Regional National Moot Court Competition. Paola Jaime (’17), James Monteleone (’16) and Jeffrey (“Randy”) Taylor (’16) rise to the challenge of a difficult competition. For weeks, the UNM Law moot court team delivered their oral arguments to federal judges, state appellate judges, and local attorneys. 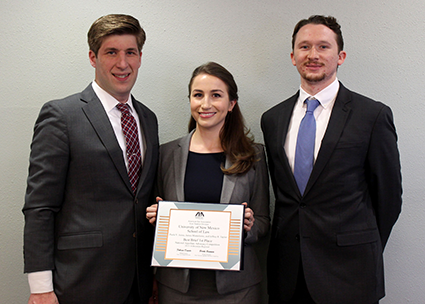 Then Paola Jaime (’17), James Monteleone (’16) and Jeffrey (“Randy”) Taylor (’16) went to the Brooklyn Regionals of the ABA National Moot Court Competition. What they discovered there relieved and thrilled them. There wasn’t a single question they hadn’t faced before. They also received their score for their brief. It was a 91. Half of the teams that go to the regionals get scores of 75 or lower, so they knew they were in the top tiers of briefs. But they didn’t learn until the last day that they won best brief. When they learned of their win, they felt united as a team, their hard work for months validated. Ecstatic, proud and grateful, they thank their coach, Ed Ricco, a director in the Albuquerque office of the Rodey Law Firm, who has coached the law school’s ABA moot court team for 13 years, for their thorough preparation. While others were enjoying winter break, the team conducted intensive research and spent considerable time writing and editing their brief. At the regionals in Brooklyn, the back-to-back oral advocacy competition was both exhausting and thrilling. The UNM Law team won the first three rounds of oral advocacy and advanced to the final round of eight to select the four teams that will proceed to nationals, but lost that round.